Rick Wagoner: Fellow board members at the Washington Post include investor Warren Buffett. 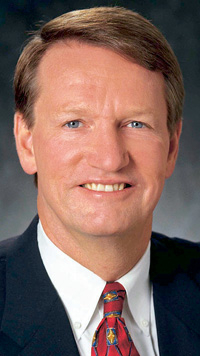 DETROIT (Bloomberg) -- Washington Post Co. said it has elected former General Motors Co. CEO Rick Wagoner to its board, boosting the number of directors to 11. Wagoner, 57, was pushed out March 29, 2009, by the Obama administration in the run up to GM's bankruptcy filing and retired officially Aug. 1. He had been CEO since June 2000. Wagoner first joined GM in the treasurer's office. He also ran the company's operations in Brazil and served as chief financial officer over the course of his career. Washington Post's other directors include investor Warren Buffett, IAC/InterActiveCorp. CEO Barry Diller, former Xerox Corp. CEO Anne Mulcahy and Melinda Gates, co-chairman of the Bill & Melinda Gates Foundation and wife of Microsoft Corp. founder Bill Gates. The Washington, D.C.-based media company said last month it was exploring a sale of Newsweek magazine, the money-losing publication it has owned since 1961, as readers defect to Internet competitors. WASHINGTON (Business Wire) -- The Washington Post Company (NYSE: WPO) announced today that G. Richard ("Rick") Wagoner has been elected to the Board of Directors. His election increases the Company`s board to 11 members. from the Harvard Business School in 1977. He was born in Wilmington, DE, on February 9, 1953, and raised in Richmond, VA.